Inherent to this new viewpoint on learning is the idea that we can no longer personally experience everything there is to experience as we try to learn something new. We must create networks which, simply defined, are connections between entities. By using these networks – of people, of technology, of social structures, of systems, of power grids, etc. – learning communities can share their ideas with others, thereby “cross-pollinating” the learning environment (Siemens, 2005). 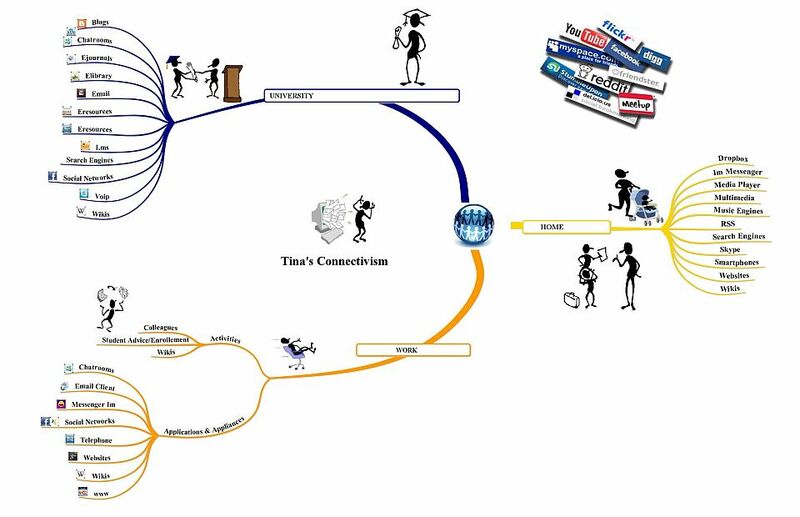 I really like your mindmap! It looks great! I think it also demonstrates very strong connections in your social network for school, work, and home. How often would you say you access and use the resources in your network? Well, I am guilty of being a network “geek”. My internet was down a couple of weeks ago for just a few hours; down for maintenance from my local provider. I had the feeling my world was standing still. Thank God, we have brains to improvise… pen, paper, and book! Mmmm… That was indeed a good old reality check on how dependent we are on technology. But that is the beauty, the technology is there and I use it where I can to enhance and complement. I cannot even say “how often” because it has become part of my life-style.